Win or Lose? CREATIVE'S new gaming headsets can make the difference! Win or Lose? CREATIVE’S new gaming headsets can make the difference! Three new models with X-Fi technology, EAX support and USB connectivity deliver a winning gaming experience. Creative, a worldwide leader in digital entertainment products, announces its new range of advanced gaming headsets. Combining the power of X-Fi audio technology with EAX support and simple USB connectivity, they give gamers a real competitive advantage. The range includes the Digital Wireless Gaming Headset HS-1200, the Fatal1ty USB Gaming hHeadset HS-1000, and the USB Gaming Headset HS-950. “We designed these headsets for gamers who want to deploy the best technology for a competitive advantage,” explains Mark Grover, European Brand Manager with Creative. “All three models feature our X-Fi technology, which delivers an amazing 3D surround sound experience over headphones. X-Fi gives gamers 3D positional audio that’s so precise it helps them pinpoint their enemies and gain a winning edge. This headset combines premium quality components and Creative audio expertise to give gamers a new edge. The USB transmitter/receiver module, which features Featuring the latest low-latency wireless technology, it delivers top-quality uncompressed audio that’s free from any compression artefacts and sounds as good as at source. 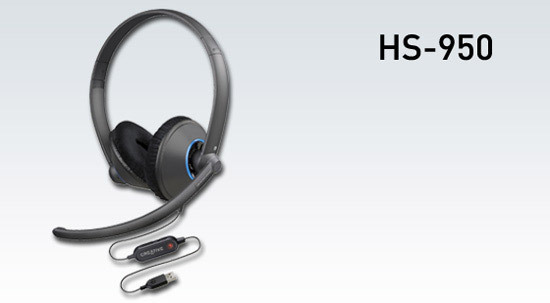 Capable of operating up to 22 metres from the USB transmitter/receiver module, the headset ensures maximum freedom and comfort during intensive PC gaming sessions. The X-Fi technology delivers true 3D positional surround sound, while the EAX support ensures ultra-real audio effects. Premium audio performance is assured by the powerful Neodymium drivers, while the low-latency design and noise-cancelling microphone gives gamers precise speech delivery. This is the headset for leaders who want to go straight to the heart of the action! It’s also great for online chat and internet phone calls. Wireless gaming headset with ergonomic design. Uses latest 2.4GHz wireless band for interference-free speech and audio over distances up to 22 metres. Uncompressed audio free from artefacts for optimum sound quality. X-Fi technology ensures the most accurate surround on headphones. EAX support for ultra-real gaming effects. Creative ALchemy technology for true 3D positional audio under Windows Vista. Cushioned earpieces with 40mm Neodymium drivers ensure effective noise isolation and rich, dynamic audio. Ergonomic design and adjustable headband for hours of comfortable play. Simple USB installation of transmitter/receiver module. One-touch controls optimised for Windows Live™ Messenger and Skype, for online chat and internet phone calls. 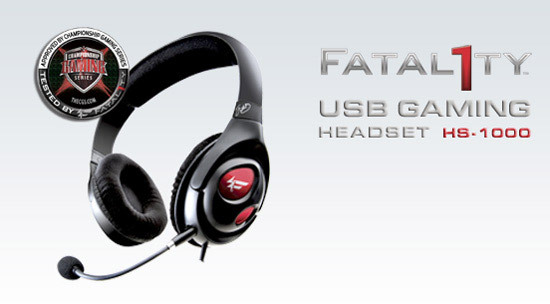 This headset gives gamers the ‘Fatal1ty’ edge when the competition gets fierce! Designed with ‘Fatal1ty’, the world-famous gamer, to incorporate his years of gaming leadership, this amazing headset uses powerful X-Fi technology for accurate 3D surround sound plus EAX to make games sound more realistic. Its light, flexible headband and soft earpads ensure ultimate comfort during long gaming sessions, aided by the fast-acting in-line volume control. USB connectivity makes it easy to install, while the detachable noise-cancelling microphone ensures optimum performance in intensive two-way competition. The HS-1000 is the best solution for ‘pro’ quality gaming audio. Developed with ‘Fatal1ty’ – the assurance of ‘pro’ quality. X-Fi technology ensures the most accurate 3D surround on headphones. USB connectivity for quick and easy installation. Designed for comfort. Cushioned earpads and a light, flexible headband reduce listening fatigue during intensive gaming. Noise-cancelling microphone can be detached to allow the headphones to be used with MP3 players. This headset uses X-Fi technologies to make every game more intense and enjoyable! Designed to deliver entertainment with a winning edge, it’s the perfect choice for gamers who want to heighten their fun on any gaming PC or notebook. Installation is simple – the headset plugs into a USB port to deliver high-end audio that will transform any game. Its X-Fi features give true 3D surround sound while its EAX support adds extra realism to supported games. When it comes to giving commands, team leaders will appreciate the precise speech of the noise-cancelling microphone, while for ultimate comfort during the longest session the entire design is flexible and lightweight with soft, ergonomic earpads. USB gaming headset for a winning edge in audio. Just plug it in! Noise-cancelling microphone for clearer commands. Tuned bass ports for deep bass and realistic effects. Soft, comfortable earpads filter-out background noise. Ergonomic design ensures many hours of intensive gaming. All these products are now shipping across Europe.